Signage led into the parish hall instead of the sanctuary. We could be more intimate here and flexible with the space. Upon entering, all ages were asked to choose a small shell and write their name on it with a permanent fine-point felt tip pen, keeping it with them until the appropriate time. They were given a worship bulletin and asked to find a seat in the circle. On each seat was placed a 4-inch square of white tissue paper and a pencil. 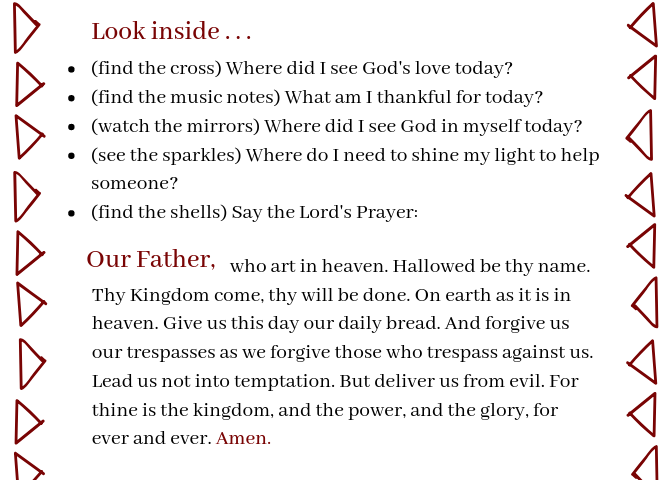 We opened with an invitation to prayer, reminding ourselves that when we entered Lent a few weeks ago we had asked God to forgive us those things which we had done or left undone. Everyone was invited to write on their slips of tissue paper what they wanted to be forgiven for. We chanted “O Lord, hear our prayer” as each brought their bits of paper to the bowl of water and dropped them in, the words washing away. A Bidding Prayer was offered, we said the Lord’s Prayer together, then the prayer of thanksgiving was said over the water – the water in the bowl as well as in the water in the bottles scattered around on the floor. We were reminded of the gift of the waters of creation that makes all things new; we are cleansed from sin by the waters of baptism. Next came a reading from Genesis 1:1–2:2, followed by a brief explanation of how we were made in God’s image as part of God’s good creation. 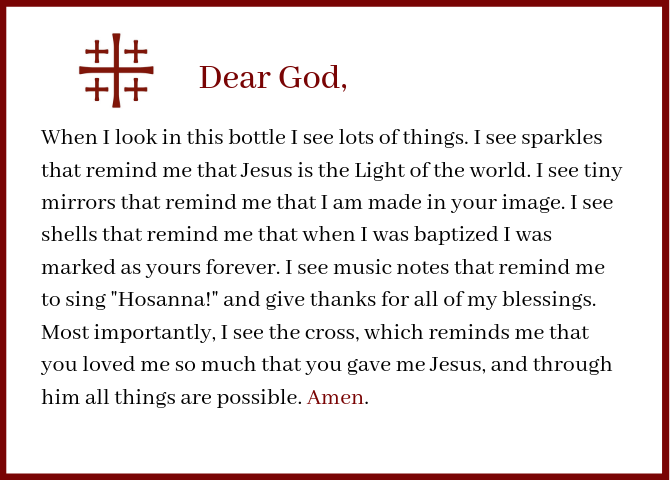 Participants were invited to choose a water bottle and directed to a table where they found small individual containers of silver sparkles and tiny mirrors, with instructions to pour these symbols into their bottles as we sang “Bless the Lord, my soul.” Where do I see God in myself? Returning to our seats, a reading from Exodus 14:10-31; 15:20-21 followed along with an explanation of how Miriam’s song of joy and thanksgiving was the first song written in scripture. Going to another table, we added small plastic confetti in the shape of musical notes as we chanted “In the Lord I’ll be ever thankful.” What brought you joy today? Another reading, this time from Isaiah 55:1-11. Even in times of hardship, God brings rain and sun to provide growth. We added some blue glitter for the sky and green glitter for the earth to our bottles while singing “Lord God, you love us.” How do you care for Creation? A reading from Ezekiel 37:1-14. God can create new life from what seems to be dead. God creates connective tissue. Bones were added to the bottle, along with a wooden peg doll “person” as we sang “Our eyes are turned.” What do you feel in your bones that you need God’s help with today? Some words from the Gospel of Luke 23:32-46. We placed a small wooden cross in our bottles. An invitation was offered: Say a prayer for someone you love and light a candle for them; place the lit candle into any sand-filled pot. We sang, “Jesus, remember me.” Where do you see God’s love? As the chanting faded away, real candles lit up the semi-darkness. A reading from Romans 6:3-11; place the shell with your name that you received earlier into your bottle. Remember your baptism and that you are marked as Christ’s own forever. More shells from a different table were added while singing “Domine Deus.” The liturgy concluded with everyone seated, gazing into their glittery bottles full of blue, green, silver, notes, bones, crosses, and shells. Psalm 71:1-6 was said together, alternating verses. During this last chant, everyone brought their bottle to a different table and wrote their name on the lid, leaving it there while singing “Ubi caritas.” We adjourned to a nearby room for supper, to pick up our bottles before departing for home. As everyone ate mac & cheese with salad, Becky and I topped the bottles off with clear liquid soap, wrapped a prayer card around the spout, and glue-gunned the lid on. They were then delivered to each person during supper. We used God’s Word, My Voice: A Lectionary for Children by Lyn Zill Briggs (Church Publishing, 2015) for the readings. And yes, you are right – these are the readings from the Easter Vigil! I think the adults enjoyed the readings as much as the kids did – you could hear small chuckles around the room when lines like “Moses said to the people, ‘Get a grip!” from the Exodus reading. Adults loved this as much as the young people. At first they were hesitant to take a bottle, thinking it was just for the kids. But they had as much “contemplative fun” as we hoped the children would have. It was quiet, people spoke in whispers, and glitter did not get all over the place. While this had a Lenten focus and tone, it could easily be adapted to an all-age Easter Vigil held late afternoon on Holy Saturday. The Pascal Candle could be lit at the beginning and Matthew’s Gospel (28:1-10) could conclude the readings with the Alleluia banner that you buried on the Last Sunday of Epiphany brought out with ringing bells. A simple Eucharist could then be shared agape-style. Sadly, not as many children attended as we had hoped. It was the “typical” Taizé crowd with a few families; ages ranged from 5 to 80+. It worked in about 45 minutes and we now have new advocates for all-age interactive liturgy!